83. 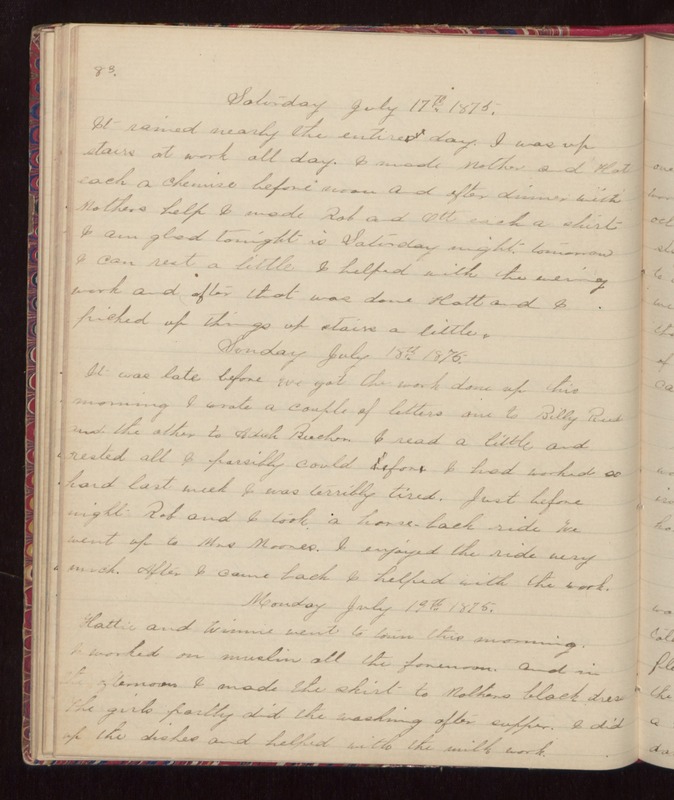 Saturday July 17th 1875. It rained nearly the entire day. I was up stairs at work all day. I made Mother and Hatt each a chemise before noon and after dinner with Mothers help I made Rob and Ott each a shirt I am glad tonight is Saturday night tomorrow I can rest a little I helped with the evening work and after that was done Hatt and I picked up things up stairs a little. Sunday July 18th 1875. It was late before we got the work done up this morning I wrote a couple of letters one to Billy Reed and the other to Adah Beecher. I read a little and rested all I possibly could before I had worked so hard last week I was terribly tired. Just before night Rob and I took a horse-back ride We went up to Mrs Moores. I enjoyed the ride very much. After I came back I helped with the work. Monday July 19th 1875. Hattie and Winnie went to town this morning. I worked on muslin all the forenoon, and in the afternoon I made the skirt to Mothers black dress. The girls partly did the washing after supper. I did up the dishes and helped with the milk work.